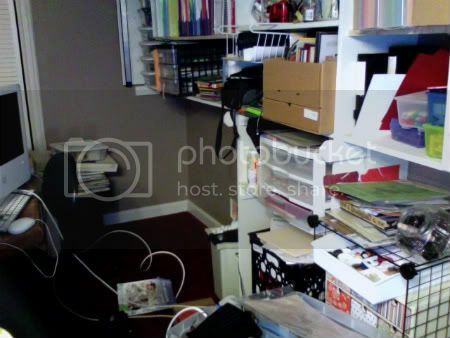 So, perhaps if I blog about the sad, sorry state of my office/craft room, I will do something about it. Promise you will help shame me into cleaning out and organizing it? Really? That's sweet. This is what I do: I have nice, organized drawers and bins. And completely overwhelmed counters and floors. Go figure. 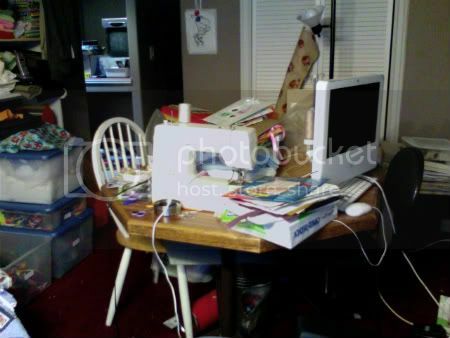 My kitchen is the same way. I have a hard time keeping the counters cleaned (read: my counters are never cleaned off) but my knife drawer? Those babies are on a rubberized mat so they don't bang around, neatly organized so they never touch. Although I do need to get rid of a couple because gah! Clutter in my drawer! So pictures, to help you shame me. Um, just going to take those with photo booth because I'm scared of losing my camera if I bring it down. So they are not great, and there won't be many but oh well. These are untouched in all their terrible messiness. Prepare yourselves. First is the sewing/dying computer table. I have my sewing machine and serger on this table. Along with some towels I'm doing something with, gift bags that need to be put away, and various and assorted papers that are hanging out with the dying computer. Nice. 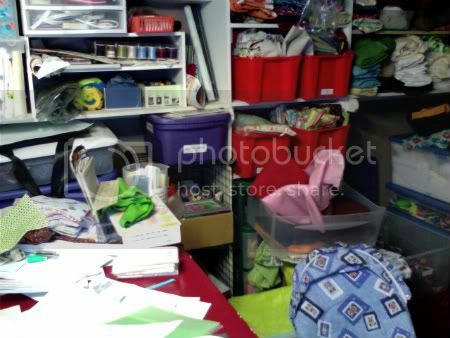 To the left you see part of the fabric stash and bins of toys because for some reason I thought it would be a good idea to put them there. Note: not a good idea. You can also see the doorway into the Man Cave, with the little tv. Those white doors are to the utility area, which needs to not be blocked. Right now? Blocked. Then we have the west wall. I have my scrapbooking and school stuff along this wall and it's pretty bad. Note the nice dark walls and maroon carpet. Maroon carpet that is. Never. Clean. Because of all it's maroon carpetness. And last? Some of the East Wall, which shows some of my stash and part of the built in table where my computer sits. Yes, the top of the table is painted maroon. Because this room is not dark enough (did I mention the light fixture? That it's a wall mounted bathroom fixture that sits above the maroon table? Oh, and did I also mention the lack of windows in this room? Yep, those are issues that will be dealt with later when B puts in real lighting on the ceiling). 0 Well, that's it. Be a little kind, but if I don't get moving on this and post improvements within the next month, stop with the kindness! Let the cleaning fun begin! Well, I won't be mean about it, but if you want someone to come help out, I'll gladly come and hold your sweet little girl while you clean. Oh, and I'll offer various opinions on what should be chucked and where things should go. How's that for helping? Or would you rather I was just mean?